Hi! The one on the left is Speedy she's two years old and the one on the right is Misty, she's six years old. Misty is a Chincoteague pony and Speedy is a Chincoteague pony too. The next one is a fiesta Mexicana dancing horse. 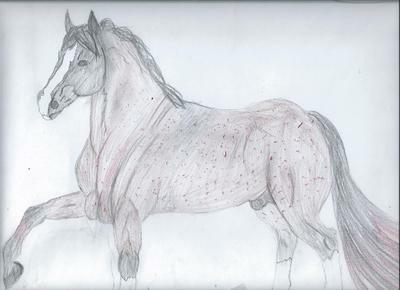 I drew this form a breyer horse. I love to draw horses! 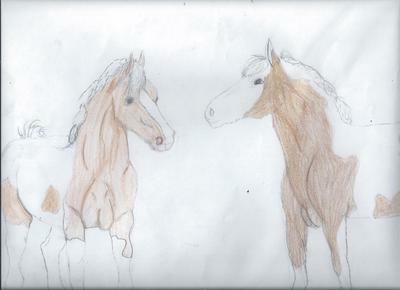 Some people say that horses are the hardest thing to draw not to me! Wow I love them! You are great at drawing! I think I done the horses pretty good mostly the fiesta dancing horse the lags are good but the back 1 need some woke on it. Misty and speedy is good to so please comment and tail me what you think Aspen. My favorite one is the "fiesta" horse.